In the first free practice sessions of the FIA World Endurance Championship’s curtain raiser on the 5.9 kilometre circuit in Silverstone (GB), Toyota topped the time sheets. However, this doesn’t come as a surprise. While Porsche runs in low downforce in Silverstone to favour its overall 2017 aerodynamic strategy, the Japanese competitor is well equipped with a high downforce aero package in Silverstone. In the first of the two 90-minute practice sessions in the morning, the two Porsche 919 Hybrids came second and fourth. In the afternoon session, that was the overall faster one, the 919s finished third and fourth respectively. In both sessions the Porsche with car number 2 of Earl Bamber (NZ), Timo Bernhard (DE) and Brendon Hartley (NZ) was the faster one. This crew’s best lap time was achieved by Bamber in 1:40.500 minutes. 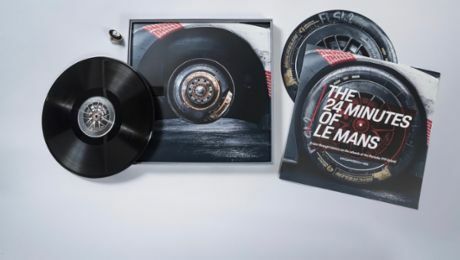 At the wheel of the number 1 sister car, shared by reigning world champion Neel Jani (CH), André Lotterer (DE) and Nick Tandy (GB), it was Lotterer who put in the fastest lap in 1:41.201 minutes. At ambient temperatures of around 13 degree Celsius and cloudy skies, the track was dry in both WEC sessions. 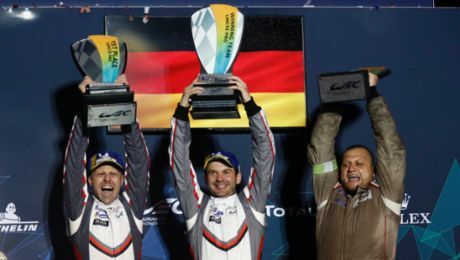 Porsche, world champions and Le Mans winners in 2015 and 2016 respectively, targets the defence of both titles. But in England the LMP team expects a difficult start. In support of the aerodynamic strategy for the entire season, the Porsche 919 Hybrids will run at the Northamptonshire circuit with significantly less downforce than the fast bends of the challenging Grand Prix track realistically demand. The race marks the return of the Porsche GT works team following a year-long development period. It runs two newly developed 911 RSR. 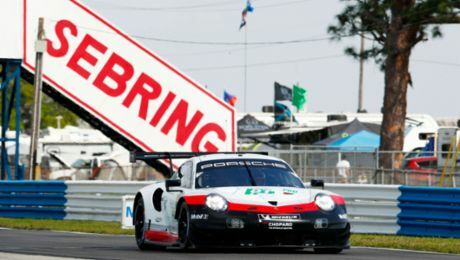 The 510 hp race car from Weissach, which is based on the seventh generation of the iconic 911 sports car, celebrated its successful debut in January at the 24 Hours of Daytona. FIA, as the world’s governing body of motorsport, has further enhanced the GT category of the WEC by officially giving it world championship status this season for the first time. The eagerly anticipated first race for the 27-car field gets underway on Sunday at 12 hrs. Track action on the 5.9 kilometre long Formula One circuit can be followed live from basically all over the world. The Silverstone Circuit with legendary corners such as Becketts, Copse and Stowe is one of the world’s most storied racetracks. On 13 May, 1950, the circuit hosted the first modern-day Formula 1 Grand Prix. The newly assembled line-up of the Porsche LMP1 works drivers feel well-rehearsed after winter testing and the WEC Prologue in Monza (IT). Reigning world champion Neel Jani (CH) has the number 1 on the car he shares with Nick Tandy (GB) and Porsche newcomer André Lotterer (DE). The number 2 sister car belongs to the two New Zealanders, Earl Bamber and Brendon Hartley, together with Timo Bernhard (DE). Four works drivers tackle the GTE-Pro class with the new 911 RSR for the Porsche GT Team at the season-opening round in Silverstone. Sharing the cockpit of the #91 vehicle are Richard Lietz (Austria), the WEC GT Champion of 2015, and Frédéric Makowiecki (France). Michael Christensen (Denmark) and Kévin Estre (France) man the #92 car. In the GTE-Am class, the Porsche customer team Dempsey Proton Racing campaigns a 911 RSR from last season with the Porsche Young Professional Matteo Cairoli (Italy), Christian Ried (Germany) and Marvin Dienst (Germany) sharing driving duties. The Porsche 919 Hybrid has been widely reworked for the 2017 championship. 60 to 70 per cent of the Le Mans prototype’s components are new developments. This goes especially for the areas of aerodynamics, chassis and combustion engine. However, the power train in principle remains the same. The innovative hybrid race car develops a system power of around 900 HP (662 kW) that comes from a compact two-litre turbo charged V4-cylinder (nearly 500 PS/368 kW) and two different energy recovery systems – brake energy from the front axle combined with exhaust energy. The combustion engine drives the rear axle while the electro motor boosts the front axle with an output of more than 400 PS (294 kW). The electrical energy that comes from the front brakes and the exhaust system is temporarily stored in a liquid-cooled lithium ion battery. The 911 RSR is a completely new development: the suspension, body structure, aerodynamic concept, engine and transmission have all been designed in Weissach from scratch. Depending on the size of the restrictor, the motor, which is now positioned in front of the rear axle, puts out around 375 kW (510 hp). Thanks to the particularly large rear diffuser combined with a top-mounted rear wing, the level of downforce and the aerodynamic efficiency were significantly improved. The 911 RSR also contests the WEC sporting the further developed factory design with the primary colours white, red and black. Earl Bamber (26, New Zealand): “Generally the day has gone really good. It is the first time we ran our low downforce aero package on a high downforce track. The guys in Weissach have done a really great job and bringing us the best that they can give. So credit to those guys. Now it is a matter of optimizing details. We are in a close fight with Toyota. Let’s see what tomorrow’s qualifying brings but the race pace seems good." The qualifying for the Le Mans prototypes will be tomorrow (Saturday), from 13:30-13:50 hrs (local time). The six-hour race gets underway on Sunday at 12:00 hrs (local time). Here is the international TV broadcasting plan. The WEC races can be followed on various international TV channels in Europe, Asia, Australia and New Zealand, North and South America as well as in the Middle East and Africa. The WEC efficiency regulations limit the amount of energy that can be used per lap. In Silverstone, the Porsche 919 Hybrid can use 5.37 megajoule of electrical power from energy recovery systems and 1.504 kg/2.076 litres of petrol. At normal race speed the Porsche 919 Hybrid is due for refuelling after a maximum of 29 laps. A lap on the Silverstone Grand Prix circuit is 5.9 kilometres and has 18 corners. The first race track at the former military air base was opened in 1947.